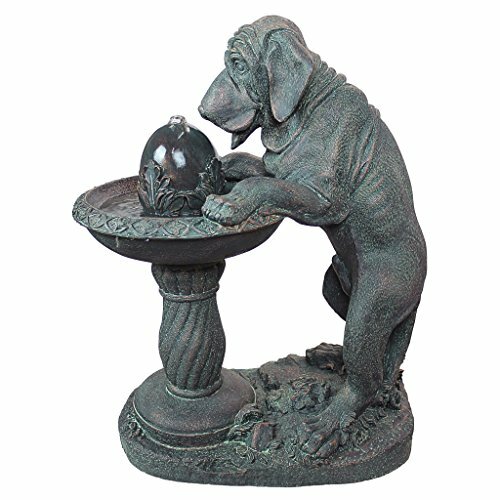 Our canine friend isn’t the only one who will be attracted to the pleasant melody of water music bubbling from the center orb and into the generous basin of this, man’s best friend fountain! Our loveable doggie is the first in line at this refreshingly distinctive addition to home or garden. Cast in quality designer resin, this splendidly sculpted Design Toscano fountain is an investment in garden art and features an integrated, UL-listed, indoor/outdoor pump. Bring inside during freezing temperatures. 21½”Wx13½”Dx26½”H. 22 lbs.